BMA House, a stunning Grade II listed building located in fashionable Bloomsbury, central London, has appointed Rowan Bennett to its events team as Sales and Marketing Manager. 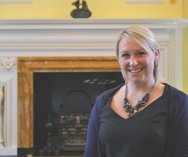 Rowan has an expanse of experience in the events industry after a role heading up the Sales and Operations teams at the Yorkshire Event Centre in Harrogate, followed by two years working on the 2012 Olympics and 2014 Commonwealth Games, before landing her current role at BMA House. Rowan joins an experienced team at BMA House and is looking forward to bringing her expertise to contribute to the already excellent reputation for great meetings and events. The grounds of BMA House were once home to Charles Dickens and the current house features many historical features which make for a grand venue in the centre of London. The venue has multi purpose event spaces with capacities of up to 300 for a conference, 200 for dinner and 320 for a cocktail party. In addition 17 purpose built meeting rooms can be hired for conferences of up to 150 delegates or smaller meetings for 10 people.